VATICAN CITY (CNS) — More than two years before the first atomic bomb was dropped, Pope Pius XII warned of the “catastrophic” consequences that could come from using the discovery of nuclear fission to create weapons. For more than 70 years, the popes and Catholic leaders around the globe have echoed that judgment. And while, for a time, the policy of nuclear deterrence was seen as morally acceptable as long as efforts continued for a complete ban of the weapons, today that is no longer the case. “Nuclear deterrence is increasingly seen as an excuse for the permanent possession of nuclear arsenals that threaten humanity’s future,” Stephen Colecchi, director of the U.S. bishops’ Office of International Justice and Peace, wrote in a 2016 article for the blog of the Berkley Center for Religion, Peace and World Affairs. The conference, sponsored by the Dicastery for Promoting Integral Human Development, will bring together Nobel laureates, government and U.N. officials, theologians and peace activists to strategize ways to move the disarmament process forward. Given that the conference is being held at a time of severely heightened tensions between the United States and North Korea, several Italian media outlets described the Vatican meeting as Pope Francis’ attempt to mediate the U.S.-North Korean crisis. Coincidentally though, the Vatican conference will take place as U.S. President Donald Trump is scheduled to visit Japan, South Korea, China, Vietnam and the Philippines. North Korea’s ongoing missile testing program, and Trump’s tough talk about destroying the nation, are expected to top the agenda of the Nov. 3-14 trip. Following in Pope Pius’ footsteps, every pope in the “nuclear age” has pleaded with the world’s powers to lessen the threat of nuclear war and reduce nuclear arsenals. In his 26 years as pontiff, St. John Paul II repeatedly and strongly called for an end to the nuclear arms race and a true commitment to disarmament. But the most striking of his pleas came in 1981 when he visited Hiroshima and Nagasaki. “In a nuclear war there would be no victors, only victims. The truth of peace requires that all — whether those governments which openly or secretly possess nuclear arms, or those planning to acquire them — agree to change their course by clear and firm decisions, and strive for a progressive and concerted nuclear disarmament,” Pope Benedict wrote in the message for World Peace Day 2006. 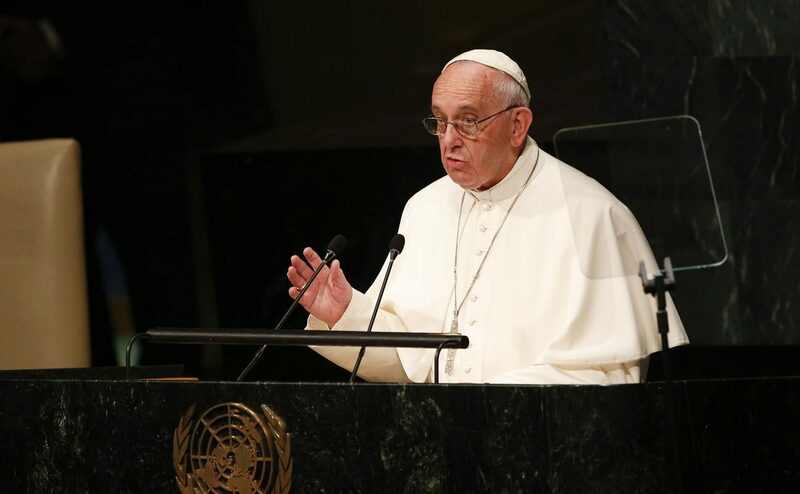 Pope Francis has continued the papal calls for disarmament and is expected to do so again when he addresses the Vatican conference.